On July 21, 1832, U.S. troops caught up with Black Hawk as his band of Sauk, Fox and Kickapoo retreated toward the Mississippi. 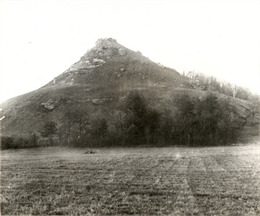 The two forces engaged in one of the state's most famous battles, the Battle of Wisconsin Heights. Earlier that day, the 120 or so warriors and about 700 non-combatants had passed through the site of downtown Madison. The Indians, who had been near starvation for weeks, hiked over what is today the Capitol Square, across the future University of Wisconsin campus, and around Lake Mendota. Several malnourished and exhausted stragglers were caught or killed by soldiers throughout the day, while the main body fanned out along diverging trails through the tall grass. At dusk they reached the south shore of the Wisconsin River, two miles below modern Sauk City, where the mounted U.S. troops came upon them as the sun was setting. "We were now compelled to fight, or sacrifice our wives and children to the fury of the whites,"Black Hawk recalled in his autobiography. "I met them with fifty warriors, (having left the balance to assist our women and children in crossing) about a mile from the river. ... I was on the rise of a hill, where I wished to form my warriors, that we might have some advantage over the whites. But the enemy succeeded in gaining this point, which compelled us to fall into a deep ravine, from which we continued firing at them and they at us, until it began to grow dark." Sixteen-year-old Satterlee Clark was in the forefront of the American charge. He had been engaged with Portage trader Pierre Pauquette to scout ahead with Ho-Chunk warriors. According to their chief Spoon Decorah, the Ho-Chunk felt ambivalent about the war: "Our sympathies were strongly with the whites. Our trading interests were with them, and we were bound to them by treaties. Yet we did not like to be fighting old neighbors like the Sacs." So "only six young men, none of them chiefs, went with Paquette as guides." Clark later described what happened in the ravine. "About one hundred and twenty half-starved [Sauk] Indians defended the pass against nearly three thousand whites, while the remainder of the Indians in plain sight were crossing the Wisconsin with the women and children; and as soon as these were safe the Indians broke and ran. Then came the struggle for scalps. Every man who could run started down the hill at his top speed, my [Ho-Chunk] Indian scouts and myself far ahead of the militia, and I was about thirty feet ahead of them all. Just as I commenced raising the hill on the other side of the valley, Pauquette passed me on horseback; and as he went by I caught his horse by the tail and held on till we reached the top of the hill, where we found four dead Indians. Pauquette took one scalp, I took one, and the [Ho-Chunk] Indians scouts took the other two." With darkness descending and steady rain falling, U.S. commanders decided not to pursue Black Hawk across the Wisconsin. Overnight some of the Sauk fashioned rafts and floated downriver toward Prairie du Chien. "I had no objection to their leaving me," Black Hawk wrote, "as my people were all in a desperate condition, being worn out with traveling and starving with hunger. Our only hope to save ourselves was to get across the Mississippi. But few of this party escaped. Unfortunately for them, a party of soldiers from Prairie du Chien were stationed on the Wisconsin, a short distance from its mouth, who fired upon our distressed people. Some were killed, others drowned, several taken prisoners, and the balance escaped to the woods and perished with hunger. Among this party were a great many women and children." The 65-year-old Sauk chief later summed up the battle of Wisconsin Heights in these words: "In this skirmish, with fifty braves I defended and accomplished my passage over the Wisconsin, with a loss of only six men, though opposed by a host of mounted militia. I would not have fought there, but to gain time for our women and children to cross to an island. A warrior will duly appreciate the embarrassments I labored under — and whatever may be the sentiments of the white people in relation to this battle, my nation, though fallen, will award to me the reputation of a great brave in conducting it." But the day was not quite done. "About an hour and a half before dawn on the twenty-second,"eyewitnesses reported, "a loud shrill voice speaking in an unknown tongue was heard from the direction of the knoll occupied by Black Hawk during the battle. There was a great panic in the camp, for it was thought that the savage leader was giving orders for an attack. ... Just before daylight the harangue ceased. "It was afterwards learned that the orator was [Sauk elder] Neapope, who had spoken in Winnebago presuming that Paquette and the Winnebago pilots were still in the camp; but they had left for Fort Winnebago during the night succeeding the battle and there was not one among the troops who had understood a word of the speech. "It was a speech of conciliation addressed to the victors. Neapope had said that the Sacs had their squaws, children, and old people with them; that they had been unwillingly forced into war; that they were literally starving, and if allowed to cross the Mississippi in peace would never more do harm. But the plea fell on unwitting ears and thus failed the second earnest attempt of the British band to close the war." The war finally came to a close 12 days later at the Battle of Bad Axe, when U.S. forces again caught up with the fleeing Indians. 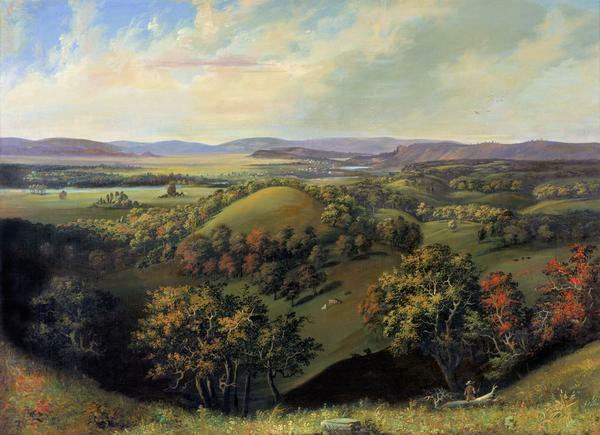 Photo (above) is a detail from the painting, Wisconsin Heights Battleground, by Samuel Brookes and Thomas Stevenson, 1856 (Museum object #1942.489).